We have completed our exploration of the Buddha’s First Foundation of Mindfulness, focusing in turn on the breath, postures, contemplation on the body, elements and death. If you are just joining the discussion, you have a ready-made curriculum in the links above. Take your own time to do so in a way that is meaningful for you. You might set aside a period of time every day to read and reflect before or after meditation practice, for example. You can also visit the pages on the right column of the blog for more explanation and basic instruction. The First Foundation of Mindfulness is one dharma lesson that could be a full life practice on its own. Sensing into physical sensation and knowing that we are sensing in to physical sensation. All that follows is rich and valuable, but only if we have laid this first foundation. You will see as we proceed how each one builds on the last. What we have learned in this exploration is the basis of vipassana practice. We could go so far as to say that without this First Foundation, we don’t have a vipassana (insight) practice since that is where the original instruction for vipassana bhavana* comes from. So let’s make sure we understand it! In our most recent class we had a discussion on anything from the previous talks on the First Foundation of Mindfulness that were still unclear, as well as any insights that came to the meditators from the explorations. We focused a good deal of our discussion on the breath. In this tradition we do not change the breath but focus our awareness on the natural rising and falling of the breath. I had to repeat this several times during the class because even though the meditators practice in this way, most have knowledge of various other trainings, such as yoga or qigong where there are breath exercises that consciously alter the breath for a particular purpose. These are all fine but they are not recommended for the ongoing practice of insight meditation. In this practice, we are not actively trying to change things to make everything right. Instead we are cultivating a way of being with things as they are. So it is how we relate to causes and conditions in our lives that is our focus. So the breath is as it is, and we cultivate our ability to attend it. This noticing may bring about change in the breath, but we are not actively working to change it. We are not finding fault with the breath for being ‘too shallow,’ a prevalent opinion in our culture. If we sit in an erect but relaxed position, we naturally open the column of the rib cage for the breath to breathe; if we notice and release whatever tension we find, and if we simply sit and know that we are sitting, the breath will be fine. Let the breath live unjudged! It certainly deserves it, as it gives us life and all. Just saying. One of the meditators mentioned a particular breath practice she has found very calming where you inhale to the count of four, hold the breath for the count of seven, then release the breath to the count of eight. So I had her lead us in this and it was very interesting. One meditator mentioned that she does a count to match her heart rate, so being led was difficult since our hearts don’t all beat at the same rate. This was a useful observation for any of us wanting to do some of these practices. I mentioned a qigong instructor named Ken Cohen who provides a series of breath exercises. These various breath practices are perfectly fine and could be valuable. I only want to be clear that they are not a part of the basic practice of insight meditation. A few minutes of breath practice before meditation could be useful in the process of establishing a personal practice. 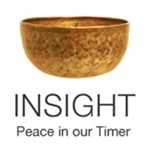 Without a teacher, a bell, a sangha, a class time, a setting that tells our busy mind ‘Now it’s time to meditate!’ we may need some amount of ritual to transition into our practice, especially at first. How could a ritual become a hindrance? I promote what I call a ‘portable practice.’ The beauty of insight meditation is that you can do it anywhere at any time. There is nothing required but the intention to be present and the intention to be compassionate. When we add rituals or objects that we depend on to get us where we want to be, then we are creating conditions that could become hindrances. ‘If I don’t have my (fill in the blank: altar, breath practice, beads, spoken chant, etc.) then I can’t meditate.’ If we set up anything too elaborate, we undermine our ability to practice in say, the airport lounge. If we are dependent on causes and conditions, then we are not centered, grounded in our own experience. So that was the review, but here are some things to consider that we didn’t cover in any of our previous explorations of the body as the First Foundation of Mindfulness. Our body is a storehouse of information as well as the vessel in which we are able to function in this world. As we deepen in our ability to sense into the body, we also learn to listen to it in a way that was probably foreign to us. If we have chronic pain or illness, this listening can help to alleviate physical suffering. With the enhanced awareness, we might notice the conditions around each occurrence. You don’t need advanced training for this, just a willingness to notice. For example, if your back ‘goes out’ you can ask what was happening in your life in the days leading up to it? What condition arose? This cause could be a difficult conversation that you had or are dreading having; a challenging deadline that lies ahead or that you failed to meet; a worry over the well being of a loved one; the loss of a job or fear about the future; guilt about the past; or any number of things that cause tension, stress and mental or emotional anguish that quite often will be experienced as physical pain. If we learn to listen to the body, then to ask questions of ourselves about what is going on in our lives and in our minds, we can alleviate the pain! If this is an interesting area of exploration for you, I highly recommend the books of Dr. John Sarno, an orthopedic surgeon who began to see the mind-body connection quite clearly in his many patients and has an excellent prescription that is free, except for the price of his paperback book, and easy. Reader, it changed my life! If it can change someone else’s, I hope you will forgive me this bit of promotion. If you know someone who might benefit, speak up. I am ever grateful to my friend who told me about it. As we age, mindfulness becomes increasingly valuable to keep us going in health and happiness. We can care for the body best by being mindful of what we are doing with it, by being considerate of its needs and by paying attention where we are going so we don’t trip and fall. We can notice if we are being overly cautious or protective, as if the body is fragile. This makes for added tension that in turn is a setup for harming ourselves, getting into pain or avoiding activities that might be healthful. We can notice if we are driving the body too hard. We can notice if this driven quality comes from some fear-based emotion, and is therefore unskillful. We can notice when we have a sense of well being. We can appreciate it without clinging to it, wishing it could stay this way. That in turn causes more tension, and then we lose the sense of well being we have found. While this is the end of our discussion of the First Foundation of Mindfulness, it is just the beginning of our own internal awareness of how to live mindfully in this human form so that we can best appreciate this fleeting gift of life. * Vipassana bhavana is Pali for insight meditation. It is the oldest of Buddhist meditation practices, as taught in the the Buddha’s Sattipatthana Sutta (which is what we are currently studying.) The word vipassana is Pali. Passana means seeing or perceiving, and vi means ‘in a special way.’ Bhavana means mental cultivation. This entry was posted in body, breath, Dr. John Sarno, First Foundation of Mindfulness, http://schemas.google.com/blogger/2008/kind#post, Ken Cohen, ritual, Vipassana on December 9, 2012 by Stephanie Noble.